So who will be 2013's big winner then!? 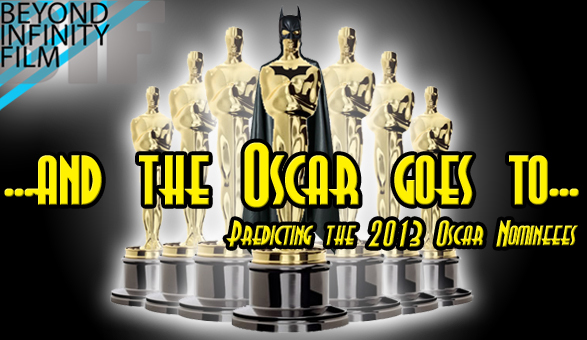 Well if my predictions are accurate next year's awards ceremony will be a two horse race (similar to this year's with Scorsese's Hugo and Hazanavicius' The Artist) between Christopher Nolan's epic BatFinale The Dark Knight Rises and the Wachowski brothers' (The Matrix) upcoming film Cloud Atlas. Now some of you may be thinking "hang on, those are two big budget Hollywood films - doesn't the Academy only like small budget art-house stuff?" Well no actually, the Academy has been known to nominate and praise a lot of big budget Hollywood films (mega-budget Avatar was nominated for best picture in 2010), and in fact a lot of them have actually won the Best Picture award (including Titanic and The Lord of the Rings: Return of the King). Besides that, what both of these films have in common is that they both to some extent actually bridge this divide by being big budget Hollywood art house films - both sporting an Oscar worthy cast of actors who have won in the past. Just from watching its trailer you can see how that logic applies to Cloud Atlas, which with its large and ambitious scale focuses on a story of humanity and life - and judging by some early reviews that have surfaced this morning after last night's première, it looks like it's got the potential to be a big hit (although one that will potentially divide a lot of audiences), and it certainly will be when the Academy give it their seal of approval. As for The Dark Knight Rises, not only is this a brilliant piece of filmmaking that well and truly deserves the recognition, I also think that there is more to it than that - enter the Oscar politics! For this case I'm going to bring in two examples; The Lord of the Rings: Return of the King, and The Departed. Both of these films won the best picture for two very different reasons, and in each case arguably for not being the best film of the year! It is widely believed that Return of the King did so well at the Oscars as recognition for the entire Lord of the Rings trilogy - and I don't think that I need to point out how this is a similar scenario to Christopher Nolan's brilliant Dark Knight Trilogy do I!? As for The Departed, most people will agree that the Oscar was awarded to this as recognition for Martin Scorsese's entire career after not having won any Oscars for any of his previous films - which the majority of people will agree are better and more original than English language re-make The Departed. Now there was a small bit of controversy back in 2011 when Christopher Nolan was not nominated for the Directing category for his brilliant film Inception - and that there is a strong chance that the Academy will see this as 'Nolan's turn'. If you take all of these factors into account, I think that The Dark Knight Rises does stand a pretty good chance of doing very well at the Oscars next February and possibly taking the big prize. Tom Hanks - Cloud Atlas; Joaquin Phoenix - The Master; Daniel Day Lewis - Lincoln; Hugh Jackman - Les Misérables; Jamie Foxx - Django Unchained. (Possible nominee: Christian Bale - The Dark Knight Rises). Halle Berry - Cloud Atlas; Anne Hathaway - Les Misérables; Keira Knightley - Anna Karenina; other two nominees to be confirmed. Michael Caine - The Dark Knight Rises (a small role that brought an extraordinary emotional weight to the film); Philip Seymour Hoffman - The Master; Christoph Waltz - Django Unchained; either Tom Hardy and Gary Oldman - The Dark Knight Rises or two actors from Cloud Atlas (or one from each). Anne Hathaway - The Dark Knight Rises (if not nominated for Leading Actress - either category the nomination would be for both roles); Amy Adams - The Master; other three nominees to be confirmed. Brave; The Pirates! In an Adventure with Scientists (titled in America: The Pirates! Band of Misfits); Wreck-It Ralph; Frankenweenie; other nominee to be confirmed. Wally Pfister - The Dark Knight Rises; Cloud Atlas; Django Unchained; Les Misérables; Lincoln. The Dark Knight Rises; Cloud Atlas; Django Unchained; Les Misérables; Life of Pi. 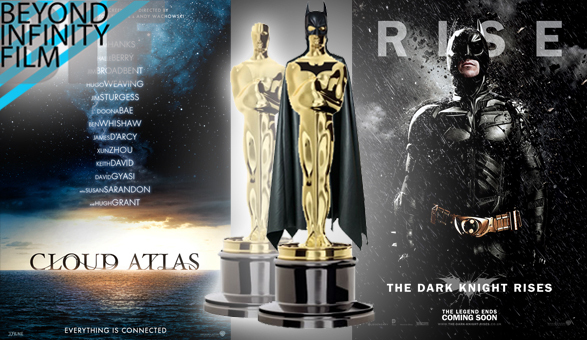 Cloud Atlas; Lincoln; Les Misérables; Django Unchained; The Dark Knight Rises. Christopher Nolan - The Dark Knight Rises; Paul Thomas Anderson - The Master; Tom Tykwer, Andy Wachowski and Lana Wachowski - Cloud Atlas; Tom Hooper - Les Misérables; Quentin Tarantino - Django Unchained; Steven Spielberg - Lincoln. Note: only five directors will be nominated in this category - I can't decide which one of these won't though! Into the Abyss: a Tale of Death, a Tale of Life; The Imposter; other three nominees to be confirmed. The Dark Knight Rises; Cloud Atlas; Django Unchained; Les Misérables; Lincoln. Lincoln; Les Misérables; Cloud Atlas. The Dark Knight Rises; Les Misérables; Cloud Atlas; Lincoln; Django Unchained. Note: I'm not entirely sure if The Dark Knight Rises or Les Misérables are allowed to be nominated here if their score are not entirely original (based on music from the previous films and the stage show respectively). 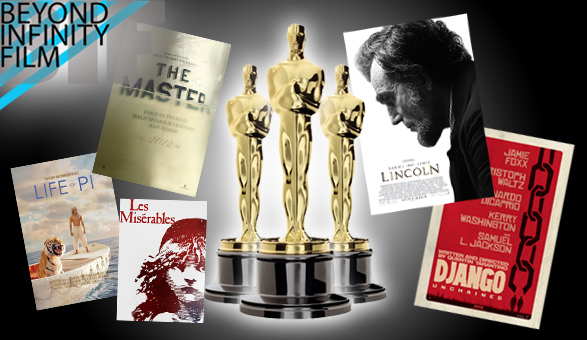 Les Misérables (one song has been written for the film); other four nominees to be confirmed (the Academy has announced that this will be the first year that five songs will be nominated for the award, after last year only two being nominated). The Dark Knight Rises; Cloud Atlas; Les Misérables; Avengers Assemble (titled in America: The Avengers); Berberian Sound Studio. The Dark Knight Rises; Cloud Atlas; Skyfall; Avengers Assemble (titled in America: The Avengers); Berberian Sound Studio. Lincoln; The Master; other three nominees to be confirmed. So what do you think of my prediction? Wrong or Right? Who do you think will win on the night? Have I missed anything off, or is it just too soon to make a prediction like this? Leave your thoughts and opinions in the comments section below.